Cam Talbot might have given the Rangers more talent in net than they bargained for. The New York Rangers found themselves on the wrong side of a five-on-three penalty kill against the Washington Capitals Wednesday. Joel Ward collected the puck on Cam Talbot’s right side and flung the puck across the goal crease to a waiting Nicklas Backstrom, who fired the puck up high and toward the net. Talbot slid across and snared it right on the goal line. The save was so unbelievable, it had to be reviewed. "Ward (had) so many options there, so I had to be as patient as possible," Talbot said. "When he zipped it across the crease there, that was pretty much the worst option for us. I kind of instinctively reached back and luckily it ended up in my glove." These days pucks are finding Talbot’s glove, his pads, his chest – pretty much everywhere but the net. Wednesday’s masterpiece save was just one of his 28 in the 3-1 Rangers win against the Capitals. "Talbot made some big saves for us," defenseman Marc Staal said after the win. "In that type of game, in a back-to-back, that’s what you need from your goalie, and he delivered." Tuesday, Talbot stopped 29 of the 30 shots he faced against the New York Islanders, who at the time were the top team in the Metropolitan Division. Talbot continues to string together strong performances, especially on the road. In fact, the 27-year-old goaltender is the first Ranger ever to allow one goal or fewer in four consecutive starts as a visitor. All this from a career NHL backup. Rangers starter Henrik Lundqvist, considered one of the league’s top goalies, has been out since Feb. 4 with a vascular injury after taking a shot from Carolina Hurricanes forward Brad Malone to the throat. Initially there was some concern when Talbot took over as the top option for New York. 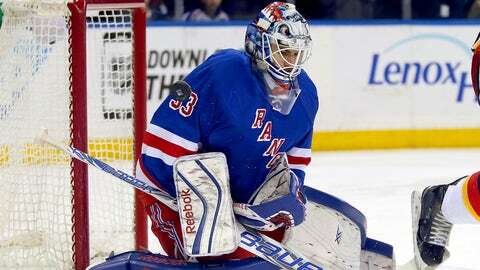 In his first 10 games after the Lundqvist injury, Talbot recorded just a .903 save percentage. But in the seven games since, it has ballooned to .950, third in the entire league among goaltenders who have played at least five games from Feb. 26 to March 11. And in those last seven games, he has surrendered just 11 goals. "[Talbot] played real well for us last year," head coach Alain Vigneault said. "Prior to Hank’s injury, he was playing some good hockey. Now we needed it to come through, and that’s what he’s done for our group. I’ve said all along, when Hank or Cam are in goal, our guys are confident." Lundqvist is still easing into practice, taking some low shots on Tuesday from his goalie coach, Benoit Allaire. There’s still no clear timetable for his return; fortunately for the Rangers, they may not be as desperate for their top goalie. Since Talbot has taken over, the Rangers have gone 12-2-3, adding 27 points and have jumped right to the top with the NHL’s best record. Talbot has emerged as a premier option for the New York Rangers.